UK retailer Aldi has expanded its alcohol delivery service, making its range of own-brand spirits available on demand. Aldi first launched its online delivery service for wine in the UK in January 2016, rolling our an online wine shop that offered wines by the case for home delivery and click-and-collect. In its first year, the site sold more than 2 million bottles, driven by sales of sparkling wine and its premium own-brand wines. Now, the supermarket has extended this service to spirits following a spike in sales, with 12,000 bottles of gin sold every day and seven bottles of whisky every minute. 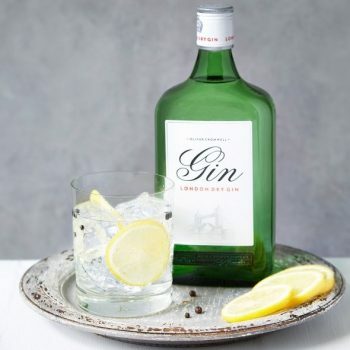 “The incredible success of our spirits range this year, including a 75 per cent increase in gin sales alone, has proven that our offering is more popular than ever,” said Julie Ashfield, managing director of buying at Aldi UK. Customers can now choose from more than 20 spirits to order, including its Oliver Cromwell London Dry Gin, Highland Black Scotch Whisky and Old Hopking Premium White Rum, with the option of creating their own case of alcohol by opting for a mix of spirits and wine. The orders can either be delivered straight to your home or a Collect+ store. Same day delivery is currently not offered, with orders delivered on the next working day when ordered before 7pm from Monday to Thursday. The online service is available to customers in the UK with no minimum order, with the exception of Northern Ireland.